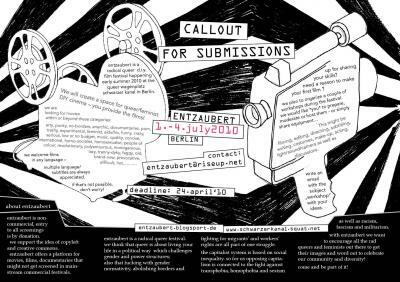 Entzaubert is a radical queer d.i.y. film festival happening for the 4th time this year on the queer wagenplatz schwarzer kanal in Berlin! Download the ENTRYFORM to send with your films HERE! have you got skills to share and enthusiasm to teach? do you have burning topics surrounding queers&film that you would like to dicuss? your participation is more than appreciated!! it’s WANTED! we will have open space for a few workshops and/or discussions. we‘re looking forward to hear from you!! taking place on the ground of schwarzer kanal, it has so far been and is still aiming to be „home“ at the queer living and community project in the heart of berlin. we totally LOVE the place and are enraged about the threat of eviction! the owners of this ground, (Alexbau/Hochtief) threatens the place with eviction, — due to gentrification and the capital’s commercial interest. read more info HERE ! find backgound, news and information how you can support the schwarzer kanal living group. no matter where the place will be this summer, we will go on with the festival! keep yourself updated and check out how you can help!